New Delhi: Soon after the Narendra Modi government came to power in May 2014, labour reforms assumed critical significance and the government took some remarkable steps to aid the ease of doing business initiative. 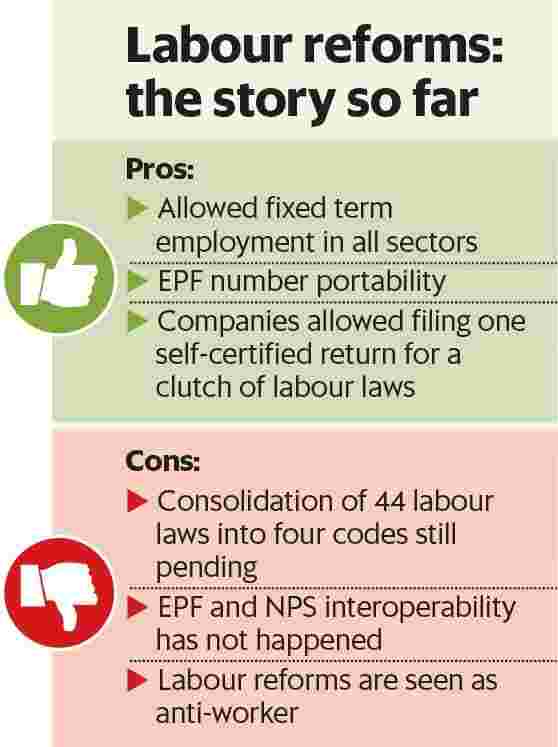 In the first two years itself, the National Democratic Alliance (NDA) partially removed the arbitrary inspection system (the so-called Inspector Raj), allowed firms to file one self-certified return for a clutch of laws, implemented employees provident fund (EPF) number portability, and initiated moves to make EPF and National Pension System alternative social security schemes for organized sector employees. The government’s announcement of its intention to consolidate 44 labour laws into four broad codes was touted as the best labour reform initiative in years. Then came the amendment to allow six months of maternity leave to women employees to help them return to work and improve women labour force participation rate and the amendment to the apprentice law allowing more young students to get trained on the shop floor. However, labour reform has slowed down in the last two years, a development that experts label as a damage control move to curb the anger of workers against the government. “Labour reform has slowed but the government did take some important moves. The six months of maternity leave and fixed term employment for all sectors are big moves," said a senior labour ministry official. “On a scale of 1-10, I will give 6 to the government on labour reforms," said Shankar Aggarwal, a former secretary at the Union labour and employment ministry. “If you look at the government’s achievements in the past four years, labour reform initiatives cannot be ignored. But most of them happened in the first couple of years after which it just slowed down," said Aggarwal. EPF reforms, permission for fixed-term employment in all sectors and the amendment to child labour law are perhaps the most striking initiatives, he said. There are perhaps three key reasons why labour reforms slowed down. First, the government was seen as pro-industry and anti-worker, inviting criticism from all the trade unions, including the Rashtriya Swayamsevak Sangh (RSS) affiliate Bharatiya Mazdoor Sangh (BMS), explained a second labour ministry official. Second, labour reform was pushed to the back seat to clear key financial reforms like the goods and services tax (GST) as the government could not have otherwise created a conducive atmosphere for passage of GST. Third, when there are not enough jobs, creating an atmosphere of mistrust among workers would have been electorally negative, explained the official. “Politics is the art of the possible…but government did slow down on labour reform. I don’t know why, but government could have done much better in the first three years itself," said Aggarwal. The Industrial Disputes Act could have been amended to improve ease of doing business, the legislative reform of EPF is long overdue and delay in implementation of the labour code will streamline reforms, he said. For the last four years, the Union government’s sole agenda was to benefit industry, said A.K. Padmanabhan, president of the Centre of Indian Trade Unions. “Workers are not a priority of the government and any attempt to say that the government is serious about the welfare of employees is only guile," he said.